If your vehicle needs brake repair, don’t wait until it's too late--bring your car to the auto mechanics at Doug’s Service Center in Topeka. When it comes to the condition of your brakes and the safety of you and your vehicle, we don’t cut any corners on auto repairs. 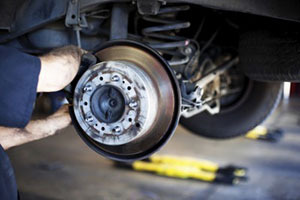 Visit our auto repair shop in Topeka for thorough and trustworthy service, including brake repair. At our auto repair shop, we are all about peace of mind, as we go above and beyond to accurately troubleshoot and repair your vehicle, including brake repair. At Doug’s Service Center we have a knack for fixing the trickiest or most complicated problems, as we won’t rest until the job is done right. And when it comes to your brake repair, accuracy is everything, as the safety of you, your passengers, and your vehicles rely heavily on the condition of your brakes. “I never have to worry about how much it will cost me when I'm in Doug's care, I know whatever is wrong with my vehicle he will not only fix it but will always be completely honest about what's involved and how much it will be... That's a real peace of mind... He's the best!!! !” -- Bradley M.
The next time your vehicle needs brake repair, turn to the auto mechanics at Doug’s Service Center in Topeka. Determined would be a good word to describe our team, as we won’t quit until your vehicle is running in pristine condition. Schedule an appointment today, or stop by at 601 Southwest Fairlawn Road, Topeka, KS 66606.